Lights... Camera... TEACH! 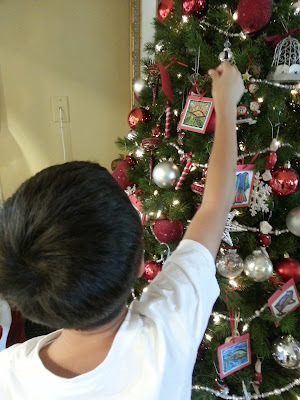 : What Am I Teaching This Christmas? It's the season of rushing and crafts and presents and buying and lines and planning and parties... and through all that busyness...I want to teach my kids how other countries celebrate this season (I'm using this from Rockin Resources as a research project for my kids and this for fun from Rachelle Smith). I am also doing some close reading activities about reindeer using this from A Grace Filled Classroom. But even more important than that, I want to teach my kids what Christmas is REALLY all about. But how do you do that when there are toy catalogs full of unfinished circles that surround each toy they "have to have"? Unfinished circles. Like these kids just zipped through the toy catalogs not being able to circle fast enough to fill their wish lists. On one page, my littlest little even drew a large greedy circle around the whole page. THE. WHOLE. PAGE. Greedy? Well, she's not greedy. She shares well and will do anything for you. But really, what do we expect when we live in a society of "Your Way Right Away" and "Bigger is Better"? Oh and the Christmas guilt is the WORST! "All of (blank)'s friends are getting this so I will feel bad if they don't have it" or whatever. I am SO guilty of this. BUT Christmas is far from guilt. or buying. or rushing. It really is all about the waiting. Advent. Waiting for the birth of Jesus. So in this crazy time, we are attempting (because we will fail sometimes) to s.l.o.w. down and enjoy the coming of the birth of our Savior. Here's how our family is doing it. 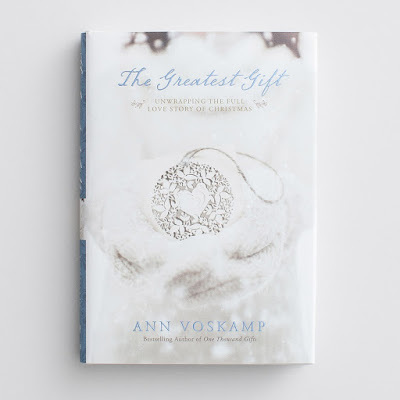 My hubby and I are reading through this AMAZING book from AnnVoskamp called the Greatest Gift. 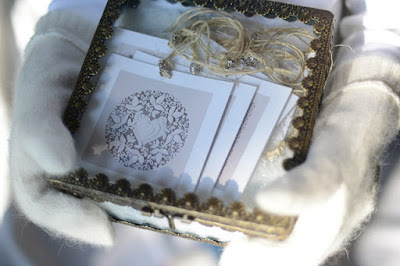 It's a short devotional everyday that begins on December 1st and has a link for special ornaments to download for each day. This book takes you through the journey of Adam to the birth of Jesus and how the events in history all point to His birth. It all culminates on Christmas Day, when we finally get to experience the birth of the anticipated Savior. 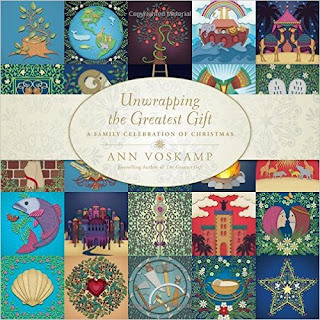 For this kids, we are using this book from Ann Voskamp. 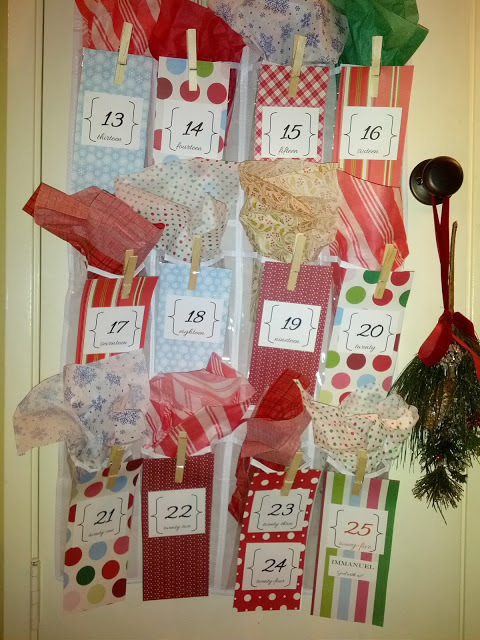 She has a children's version of the Advent book called Unwrapping the Greatest Gift that we are reading everyday with the kids as we cuddle on the couch. Each day the kids take turns and go to our "Advent" calendar and unwrap the next ornament. 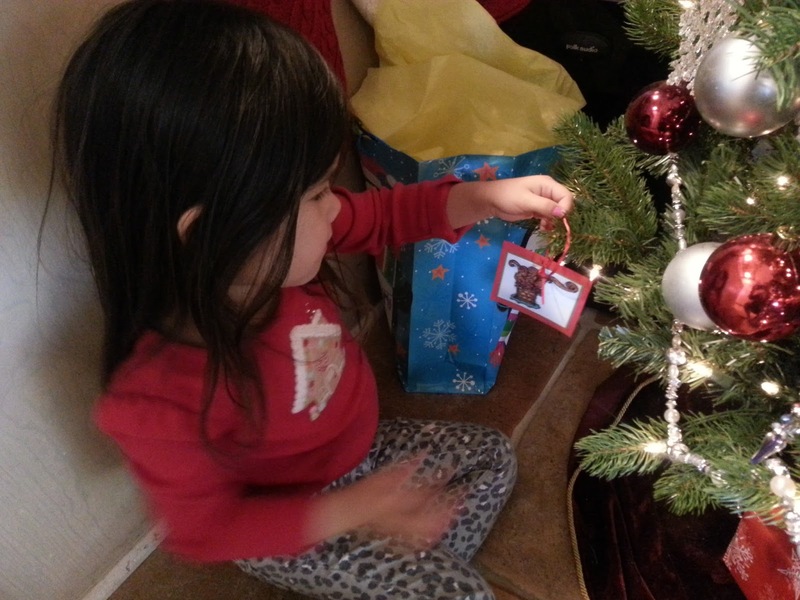 We read and they put the ornament up on our tree. Again, the book goes from the creation of the world and culminates on Christmas Day, where they get to unwrap the Greatest Gift. These colored ornaments are the older versions. She has all white ones now (pic above) that I haven't put together yet, so we just used the ones I had for this year. I'm hoping to refocus our family on what this season is REALLY about. After all, we ARE celebrating Jesus' birth. He deserves the gift that our hearts can give.